Our office will use specific tools that are designed to wash away any calculus, or tartar, that has accumulated on your teeth. Tartar resides above and just below your gum line and must be removed in order to prevent tooth decay. After our office uses our modern technology and equipment to remove the calculus, they will then use another hand instrument to further remove any remaining tartar. After your teeth have been given a fresh clean, the dentist will use an abrasive substance that further removes plaque, while also removing minor surface stains for a completely fresh look. The polishing substance is flavorful so that children can enjoy it. It is very hard to achieve excellent teeth without visiting your dentist at least twice a year for a routine dental cleaning. This is because traditional brushing methods are unable to remove tartar, though plaque prevention is still possible. 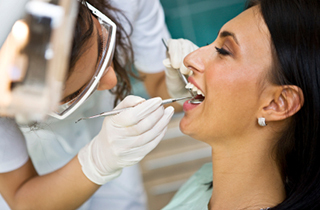 The American Dental Association (ADA) recommends that patients visit a dentist twice every year. Most insurance will cover two visits as a result of this recommendation. If you are unsure, then please contact your dental insurance provider and they will clear up any confusion. If you want to learn more about the dental cleaning procedure or if you have any other questions or concerns, then please call our office at 208-664-9225 and one of our receptionists will be able to help you out.